Dominating the 20th Century battlefield and beyond, the AK-47 is arguably the world’s most influential rifle. Now you can discover how the elegantly simple weapon beat the odds to become the legend it is today in AK-47: Survival and Evolution of the World’s Most Prolific Gun. Categories: AK, Gun Collecting, History, Military Weapons, Tactical, Gun Collecting Books SKU:: N/A Format:Digital Book (PDF), Paperback ISBN: 9781946267108. The Complete History Of One Of The World’s Most Iconic Guns! Dominating the 20th Century battlefield and beyond, the AK-47 is arguably the world’s most influential rifle. Now you can discover how the elegantly simple weapon beat the odds to become the legend it is today in AK-47: Survival and Evolution of the World’s Most Prolific Gun. Former Soviet Spetsnaz soldier Marco Vorobiev details the rich history of the rifle, its design and dissemination across the globe, and how it survived both inside political pressures and constant competition from newer firearms designs in this definitive volume. Masterfully told, Vorobiev weaves a spellbinding tale about the rifle and its development, not only appealing to AK-47 buffs and shooters, but also anyone remotely interested in firearms history and design. Not only do readers discover the advantages the rifle gave the common soldiers armed with it, but the modern upgrades that continue to make the tried-and-true Kalashnikov the among the most formidable weapons systems available today. AK-47: Survival and Evolution of the World’s Most Prolific Gun is the definitive reference on the rifle. 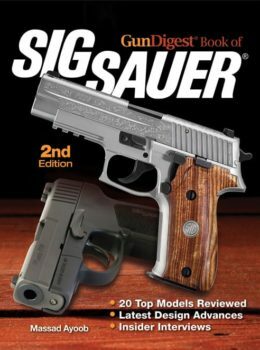 No shooter, collector or enthusiast’s library is complete without the guide. 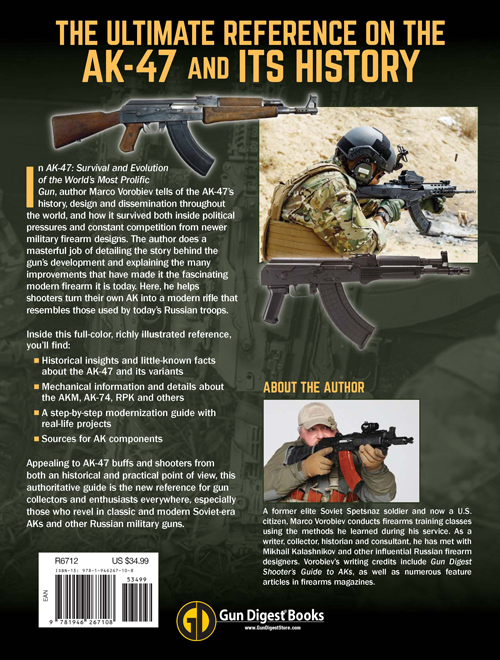 -Historical insights and fact about the AK-47 and its variants. -Mechanical details about the AKM, AK-47, RPK and other guns. -Step-by-step modernization guide and real-life projects. A veteran of the elite Soviet Spetsnaz, now a U.S. citizen, Marco Vorobiev conducts firearms training classes using the methods he learned during his service. As a writer-consultant, Marco has handled and tested even the rarest AK variants. He is a prolific writer and contributor for firearms media, and has written hundreds of articles on AK history, training, practical application, modification and improvement. His articles have appeared in numerous firearms publications, including Guns & Ammo and Shotgun News. What Would the Russians Do Next?